Women at a press conference speak out about sexual harassment. For a long time, gender discrimination and sexual jokes against women in the workplace were considered a trivial issue. In such an atmosphere, victimized women mostly suffered silently, thinking they should not make a big deal out of it. It was not uncommon to hear people say that women need to cope with men in order to work in a male-dominant workplace, or that mature women should deal tactfully with men’s sexual jokes. However, since the early 1990s, the English word “sexual harassment” became known in Japanese, often abbreviated as “sekuhara”, and there has been rising consciousness against sexual harassment in the workplace. This change of thinking was also influenced by the promotion of a sense of gender equality at work, encouraged by the enactment of the Equal Employment Opportunity Law for Men and Women. 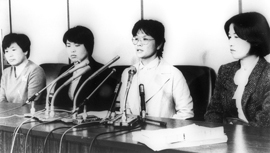 During this period, there were sexual harassment law suits at various companies and many decisions supported women’s demands for compensation. The revised Equal Employment Opportunity Law for Men and Women, which took effect in 1999, required employers to take steps to prevent sexual harassment. Click CHART to see the result of a 1997 Sexual Harassment Survey by the Ministry of Labor.